Bam! Crash! Pow! Learn to draw the action and energy of the superhero powerhouses in today's most exciting comics with best-selling art instruction author Christopher Hart. 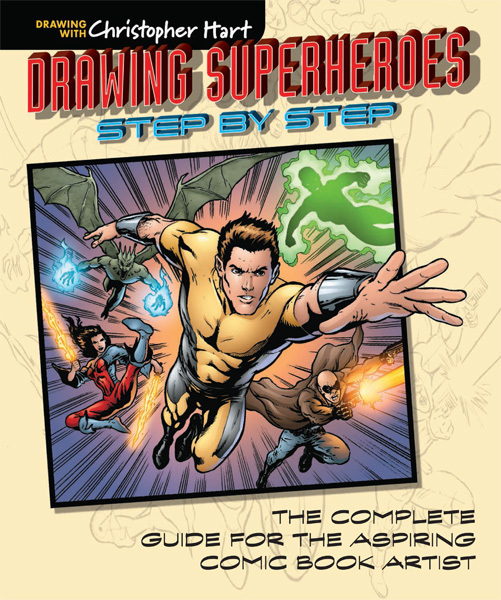 In Drawing Superheroes Step-by-Step, Chris covers the basics of drawing the bold faces and chiseled physiques of compelling superheroes, heroines, and evil supervillains along with a cast of supporting characters such as news reporters, mutants, and more. He then shows how to not only draw those characters in classic, dynamic action poses, but also how to place them within the perfect layout and composition. Truly comprehensive in scope, this book delivers all the details on fine-tuning foundational drawings, with tutorials on exaggeration, expressions, costumes, light and shadow, and splash page creation. Christopher Hart's straightforward approach and step-by-step instruction will have aspiring artists drawing immediately and will give more seasoned artists the tips they need to take their comics to the next level.